The Antik - Center Hamburg will close on 31.03.2019! Artifacts from Prehistoric to Present Time. Saturday from 10-16 Clock, during the week please make an appointment! Ethnological Jewelry from Tribes as Tuareg, Naga, Hmong and others. Chinese Jade Art from Prehistoric until Historic Times. Stone Age Artifacts like Arrowheads, Axe Blades, Stone Knives, Drills, Chisels and others, including ancient Bronze and Ceramics. Artifacts of the Maya, Roman and much more! Our shop He-Artefakte is located approx. in the middle of the Antik-Center, direct next to the restaurant "Villa Rosa"
Ask for the shop D5 (He-Artefakte), Mr. - or Mrs. Henze. Neolithic Hunter approx. 2000 B.C. "Blochwitz - Kunsthandel - Antiques"
Englische Möbel - vorwiegend aus Mahagoni. Große Auswahl von antiken Silber. Antike Uhren, - Glas -Karaffen und - Bilder. Na, wie gefalle ich Euch? Ich bin zwar nicht antik, aber ich gehöre dazu ! Sie suchen etwas antikes für Ihre Küche? Bestecke, Kaffemühlen, Keramik, Silber, Lampen oder andere Küchenutensilien? Dann schauen Sie doch einmal bei uns rein, sicherlich werden Sie in unserer großen Auswahl etwas passendes finden! Orden, Ehrenzeichen, Urkunden, Fahnen, militärische Antiquitäten, Literatur, Blankwaffen, Uniformen, Kopfbedeckungen, Lineol- und Elastolinspielzeug, Zinnfiguren, Möbel, Porzellane, Silber u. mehr. In the Antik Center with its approx. 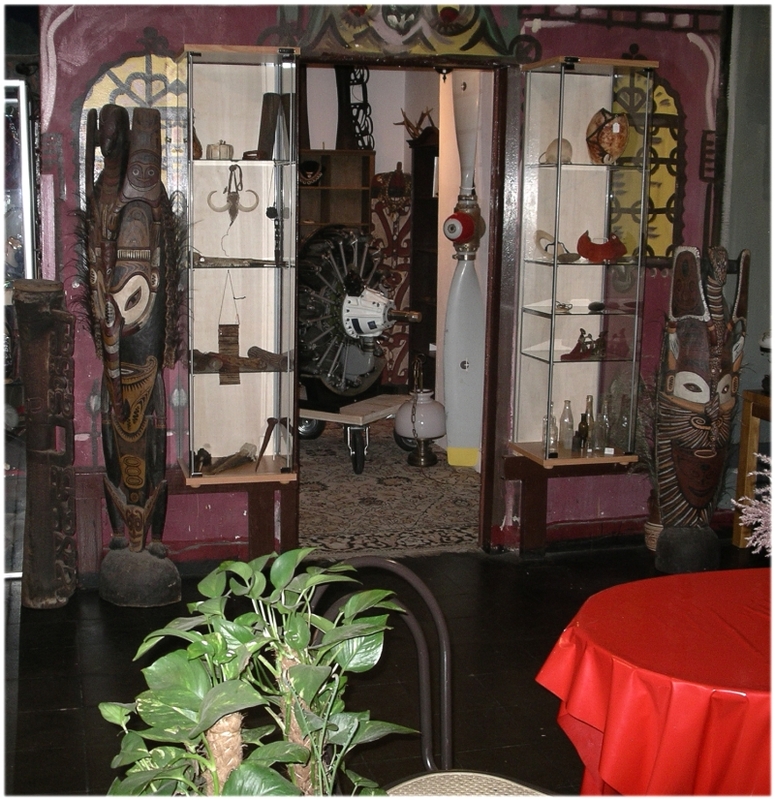 25 antique stores and the café "Villa Rosa", you can take a look around undisturbedly. At every weather you can stroll dryly and warm among comfortable ancient stores with most various offer through little lanes under a romantic town arcade (basement of the covered old market hall). How can I reach the Antik-Center? The Antik Center is located near the Central Station "Hauptbahnhof", down the basement of the old market hall (Alte Markthalle) in the area of the "Deichtorhallen"
Subway (U-Bahn U1), Stop "Steinstrasse", Exit Direction "Klosterwall", only 1 - 2 Minutes to the Antik Center. Distance from/to Hamburg Hauptbahnhof, Central Station, only approx. 8 Minutes by feet. If you will come by car, you will find a parking possibility direct at the back entrance of the Antik-Center, coming from the Amsinckstrasse direction "City Center". Closed on Sunday and Monday! during the week please make an appointment! All rights, also the statement wise reprinting, photo mechanical or digital reproduction, alteration and translation are reserved only to He-Artefakte, Ernst-Dieter Henze.